Author Kitty Kelley says there is a good reason Oprah Winfrey has been dishing out so many confidentially agreements on her path to superstardom. In unauthorized biography, "Oprah: A Biography," which will be released on Tuesday, Kelley paints a picture of some sordid episodes in Winfrey's past. Winfrey has already revealed that she was sexual molested and pregnant by the time she was 14 and that the newborn died in birth. Kelly reportedly says there's more to the story. "This book goes into much more detail. This book names the little boy that she gave birth to, presents the birth certificate and tries to show how these secrets, these awful secrets, controlled Oprah for most of her life," Kelley told the The New York Times. In her book, Kelley also details Winfrey's 1970s romance with former "Entertainment Tonight" and radio talk show host, John Tesh. The New York Daily News, which obtained the book, reports that a young Winfrey shared her Nashville apartment with Tesh until he bolted in the middle of the night. According to Kelley, the "social pressure" on an interracial couple in Tennessee at that time proved too much for Tesh to handle. The newspaper also reports that another Tesh ex-paramour told Kelley, "He said one night he looked down and saw his white body next to her black body and couldn't take it anymore. "He walked out in the middle of the night. ... He told me he later felt very guilty about it." According to published reports, Kelley's book covers rumors of a homosexual relationship between Oprah and her BFF, Gayle King, and Oprah's love-hate relationship with food, which included eating two pecan pies in one sitting. Kelley thinks she may encounter trouble promoting this book. "We have already been told by Barbara Walters's producer, No, you cannot be on 'The View,' I cannot disrupt my relationship with Oprah. Joy Behar, the same thing. 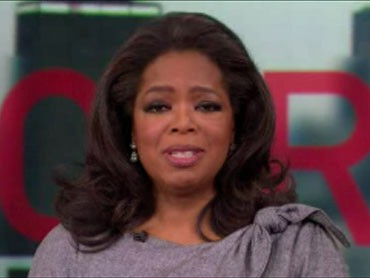 Charlie Rose; Larry King said, I will not do it, it might upset Oprah. Even David Letterman," Kelley told the New York Times.